Alcorn looking for its second title in five years, Southern its first since 2013. When Southern and Alcorn faced each other in late September, many thought that it could be an early preview of the conference championship game as both teams sat atop their respective divisions. In that game, however, it was Alcorn that got the best of Southern as the Braves defeated the Jaguars on their homecoming 20-3. A little over two months have passed and the two teams meet again on Saturday afternoon in the 2018 Toyota Southwestern Athletic Conference championship game. With Alcorn looking to win its third SWAC title in five years and Southern looking to win its first since 2013, this year’s title game has the makings for a great one and has already made history before the first whistle has been blown. Due to the SWAC changing the site of the championship game – bringing the game to the venue of the SWAC team with the most conference wins – Alcorn is hosting the first ever SWAC championship at its stadium, Jack Spinks-Marino Casem Stadium. Alcornites will be in full force on “The Reservation” as this game is like another home game for the Braves but with a championship atmosphere. However, Jaguar Nation will be in attendance and will generate a good portion of the crowd, hoping the Jaguars can get the victory. Before the game, here’s a look at how the teams stack up against each other and key players to watch from both sides. The Braves enter the game ranked second in the conference in scoring offense (33.2 points per game), first in total offense (471.3 ypg), total defense (allowing 283.4 ypg), rush offense (274.3 ypg) and rush defense (allowing 93.2 ypg). In categories where they are not atop the conference statistically, the Braves rank sixth in pass offense (197 ypg) and fourth in pass defense (190.2 ypg). Alcorn (8-3, 7-1) also ranks first in the number of first downs earned in games (averaging 23.2), first in limiting opponents first downs (15.9), first in time of possession (33:11), third in third-down offense and second in third-down defense. QB – Noah Johnson: Johnson has thrown for 1,944 yards and 15 touchdowns and eight interceptions and rushed for 813 yards and seven touchdowns. Johnson sits second in the conference in total offense and sits as the second-leading rusher for the Braves. RB – De’Shawn Waller: Waller has rushed for 871 yards and nine touchdowns, averaging 108.9 yards per game and 5.7 yards per carry. Waller leads the team in rushing and sits second in the conference in rushing yards. RB – P.J. Simmons: Simmons has rushed for 712 yards, averaging 64.7 yards per game. RB – Marquise Forman: Forman has rushed for 281 yards and two touchdowns. WR – Raidarious Anderson: Anderson has caught 28 catches for 459 yards and three touchdowns. Anderson ranks seventh in the SWAC in receiving yards and averages 16.4 yards per catch. WR – Chris Blair: Blair leads the Braves in receiving yards and receiving touchdowns with 38 catches for 487 yards and six touchdowns. Blair averages 12.8 ypc and ranks eighth in receiving in the conference. WR – Dayall Harris: Harris has recorded 391 yards on 22 catches for four touchdowns. Harris leads the team in yards per catch (17.8). DB – Javen Morrison: Morrison has broken up seven passes and recorded three interceptions. DB – Brady Smith: Smith has broken up five passes, recorded an interception and one fumble return. K – Corey McCullough: McCullough is 13-of-21 in field goals this season with this longest being for 46 yards. DB – Qwynnterrio Cole: Cole leads the Braves in tackles with 61 with 34 solo, three pass breakups, and three interceptions. LB – Solomon Muhammad: Muhammad has recorded 52 tackles with 20 solo, 6.5 tackles for a loss and four sacks. LB – Terry Whittington: Whittington has recorded 44 tackles with 18 solos. He ranks third in the conference in tackles for a loss (12.5) with nine solo and fourth in sacks (7.5). DL – Sterling Shippy: Shippy has recorded 12.5 tackles for a loss with eight being solo, fifth in the conference in sacks (7) and two forced fumbles. LB – Brelion Hollis: Hollis has recorded six tackles for a loss, two sacks, and two forced fumbles. DL – Darrell Henderson: Henderson has recorded three sacks and two forced fumbles. The Jaguars sit fourth in the conference in scoring offense (28.3 points per game), sixth in total offense (373.9 yards per game), second in rush offense (207.7 ypg), seventh in pass offense (166.2 ypg), second in offensive efficiency, sixth in first downs earned per game (18.5) and second in third-down conversions. 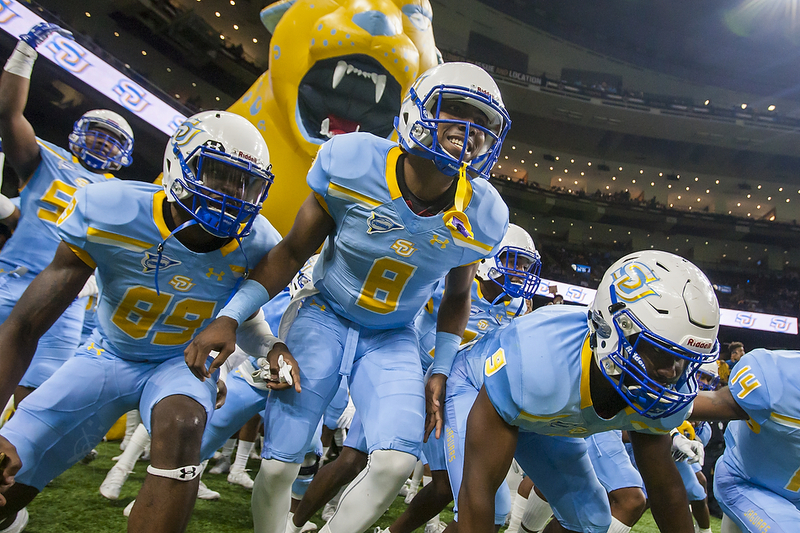 Defensively, Southern (7-3, 6-1) ranks third in scoring defense (24 ppg), third in total defense (358 ypg), second in rush defense (136.9), seventh in pass defense (221.1 ypg), fourth in defensive efficiency, third in limiting its opponents first downs and third in third-down defense. QB – Ladarius Skelton: Skelton has thrown for 803 yards and rushed for 465 yards on 79 carries for five touchdowns. The Pine Bluff, Ark., native ranks seventh in total offense and averages 5.9 yards per carry and 51.7 rushing yards per game. RB – Devon Benn: Benn has rushed for 728 yards on 146 carries for three touchdowns, averaging five yards per carry and 72.8 ypg. He also ranks sixth in the SWAC in rushing, 16th in total offense and eighth in all-purpose yards with 101 receiving yards. QB – John Lampley: Lampley has rushed for 353 yards and a touchdown. RB – Carlos Stephens: Stephens has rushed for 158 yards, averaging 5.1 yards per carry. RB – Darbbeon Profit: Profit has run for 123 yards, averaging 8.8 yards per carry. RB – Jamarqueza Mims: Mims has rushed for 90 yards and two touchdowns, averaging 5.3 yards per carry. RB – Christopher Chaney: Chaney has rushed for 82 yards and a touchdown, averaging 5.9 yards per carry. WR – Kendall Catalon: Catalon has caught 31 passes for 406 yards and five touchdowns (12th best in the SWAC), averaging 13.1 yards per catch. He has also rushed for 69 yards and two touchdowns, averaging 8.6 yards per carry. WR – Trey Smith: Smith has tallied 21 receptions, 361 yards and seven touchdowns, averaging 17.2 yards per catch and 36.1 yards per game. Smith is second behind Catalon in receptions and receiving yards. WR – Randall Menard: Menard has recorded nine receptions, 184 yards, three touchdowns, averaging 20.4 yards per catch (leads the team) and 20.4 yards per game. WR – Cameron Mackey: Mackey has caught 13 passes for 156 yards and a touchdown, averaging 12 yards per catch and 17.3 yards per game. LB – Calvin Lunkins: Lunkins sits 11th in the SWAC in tackles (72) with 32 being solo, averaging 7.2 per game. He also ranks ninth in tackles for a loss (10.5) and has recorded 2.5 sacks and two forced fumbles. DB – Demerio Houston: Houston has recorded 44 tackles with 30 solo, averaging 4.9 per game. Houston also has defended six passes and recorded two interceptions (second on the team). DB – Montavius Gaines: Gaines has recorded 43 tackles with 27 solo, averaging 4.3 per game. DB – Chase Foster: Foster has recorded 40 tackles with 24 being solo, averaging four per game. LB – Jordan Lewis: Lewis has compiled 10 tackles for a loss (sixth in the SWAC), nine solo sacks (first in the SWAC) 10 total. DE/LB – Tyran Nash: Nash has compiled for 7.5 tackles for a loss and three sacks. DE – Jahmal Tillman: Tillman has recorded two sacks. CB – Jakoby Pappillion: Pappillion has defended six passes, recorded three pass breakups and three interceptions (leads the team). DB – Elijah Small: Small has defended five passes. DB – Timothy Thompson: Thompson has defended five passes and recorded two interceptions.